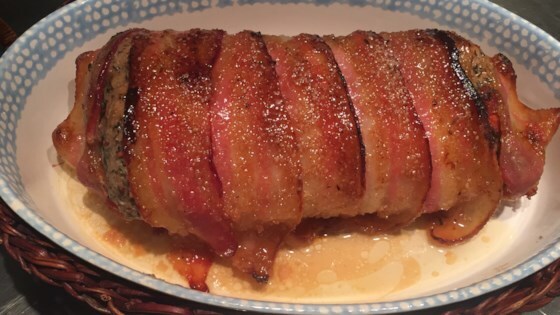 "This juicy, tender pork loin is wrapped in bacon and roasted with a sweet honey balsamic glaze." Preheat oven to 375 degrees F (190 degrees C). Line a shallow roasting pan with aluminum foil. Season pork loin with salt and pepper. Wrap the bacon slices around the pork loin and secure with toothpicks. Preheat a large skillet over medium-high heat, then add the pork loin. Cook until golden brown on all sides, about 10 minutes, then place onto roasting pan. Stir together honey, balsamic vinegar, red wine, onion, and rosemary in a small bowl; spread over pork loin. Roast the pork loin in preheated oven for 15 minutes, then sprinkle with raisins. Continue cooking until the internal temperature of the pork loin reaches 145 degrees F (63 degrees C), about 15 minutes more. Remove from the oven, and allow to rest for 5 minutes before removing toothpicks and slicing.